Noise disturbance; an underexposed but serious problem in the city. 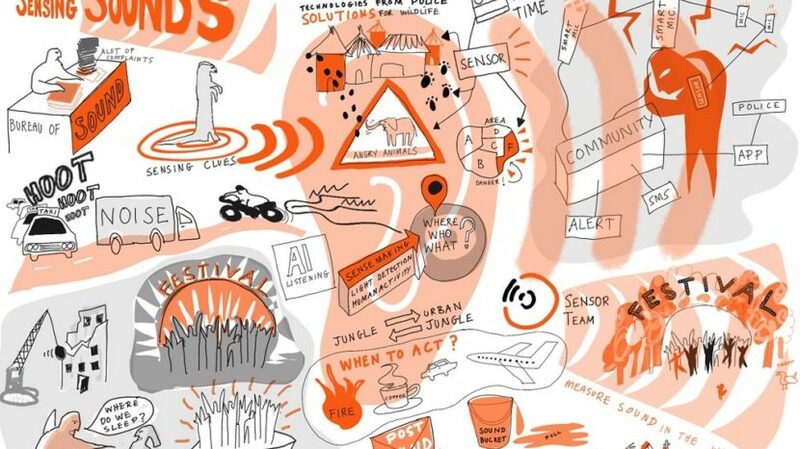 Sensemakers AMS search for solutions, using sound sensors and artificial intelligence. Sensemakers AMS is a group of people from different disciplines who regularly meet to share knowledge about Internet-of-Things (IoT) solutions for social issues. At the Marineterrein Amsterdam they have created a test set-up to measure the water quality and they have contributed to the development of new methods for detecting ‘leaks’ in the sewer, which is of great importance in the improvement of water quality in cities. From 6 February 2019, the Sensemakers will start with a new challenge: converting the sounds in the city into relevant data with which the noise nuisance can be tackled. “Noise pollution is a slow killer”, the Ombudsman Arre Zuurmond of the Amsterdam Metropolitan Center at a Sensemakers meeting at the end of 2018. In the months before he had experienced firsthand the effect of non-stop noise: he lived for four months in the Red Light District in Amsterdam. “Boats, countless taxis, honking cars, music from cafes, drunken people, quarrels on the streets, all night long. You do not get enough rest, which can be devastating” he said. The question now is: can you use sensors to continuously measure what happens, discover patterns and thus come up with better solutions? The Amsterdam Sounds project will start in the first quarter of 2019. At various places in the city, citizens are enabled to measure noise pollution with the help of sensors. This project is a collaboration between Waag, Ombudsman Metropoolregion, municipality of Amsterdam and Sensing Clues. The Sensemakers will help build these user-friendly sound sensors and underlying software with which relevant data can be displayed and the different sound source can be distinguished. The latter is very complicated because different sounds can be stacked and not every sound is equally annoying. The sensors from Sensing Clues, maker of sound sensors in tropical rainforests, can offer a solution. These sensors measure specific sounds almost continuously; think of gunshots, forest fires and trees. The data from the sensors are collected and analyzed at a central point so that the rangers who have to maintain can quickly see if and where they should take action. Every first Wednesday of the month, Sensemakers AMS meet at the OBA to work on challenges. Sensing Clues is also on board. The aim is to develop prototypes that will be tested on the Marineterrein. Every third Wednesday of the month, sessions about sensing are organized at Codam on the Marineterrein. The Meet-ups are freely accessible. For more information, visit https://www.meetup.com/sensemakersams.